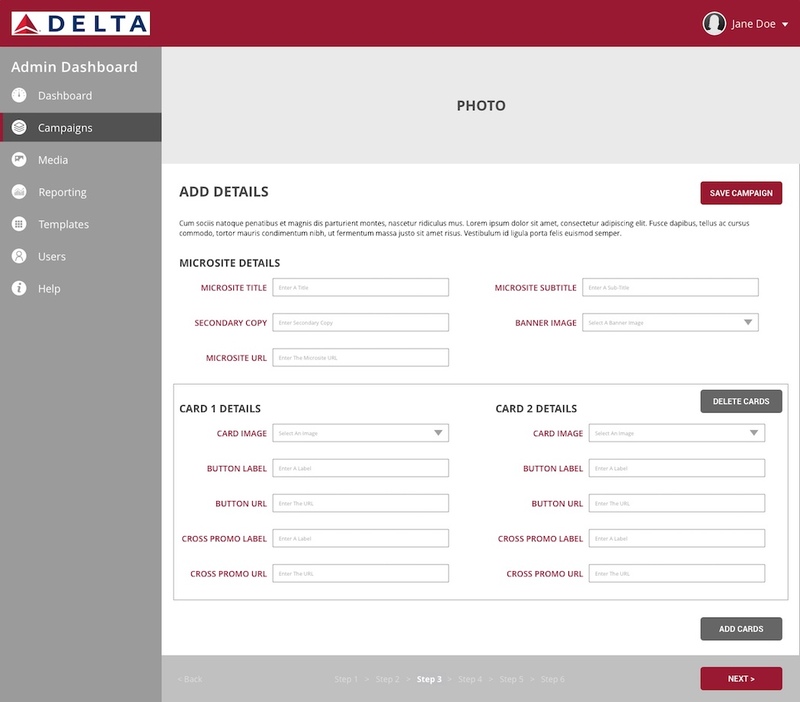 Delta Airlines requires updates to microsites during various campaigns over the year. Delta Airlines often needs to make updates to these campaign landing pages and various material on the fly and ahead of time. Costs relating to updates to material and creating new material tend to accelerate over time and Delta Airlines are looking for a solution to 1. Easily update existing campaign material and 2. Reduce the cost of these updates as much as possible. In the summer of 2017, I worked with DSG Interactive of RRDonnelley to create a solution to their needs. We listened to the dilemma that Delta Airlines has been experiencing, collected and analyzed information received and collected and came up with a solution to achieve both goals, easily update existing campaign material, and reduce the cost of updates and include a Do-It-Yourself option for really minor updates. 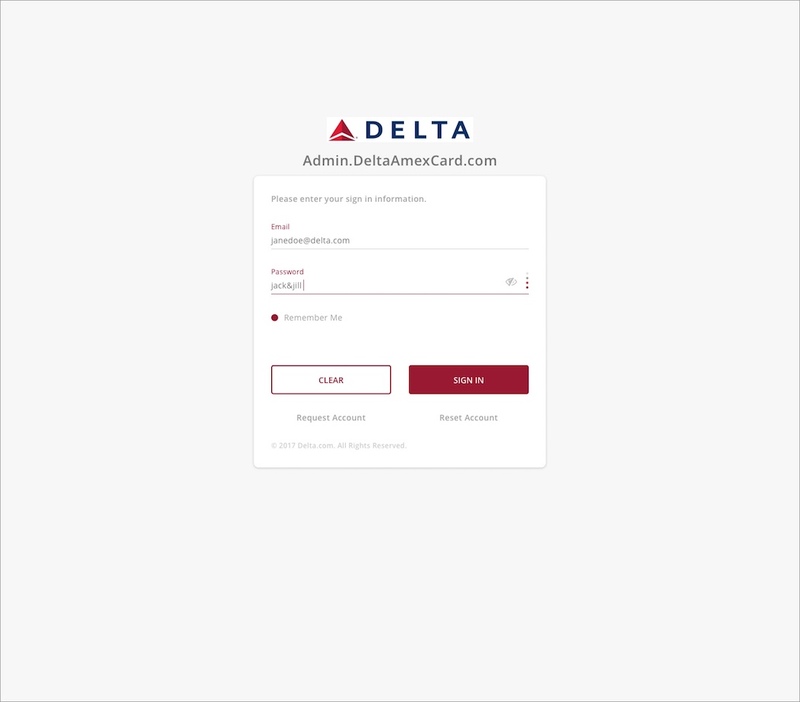 Delta Airlines updates microsites for their AMEX campaign pages. They want to update the content on these microsites much more frequently without production delays as well as minimizing design & development costs. Working directly with DSG Interactive of RRDonnelley, I set about gathering all background details and information from the DSG and Delta teams. I worked directly with Bhawini Naik, Les, and Eric Steinhilber to gather all relevant information to create three documents, a Competitive Analysis, a User Workflow diagram, and Wireframes for the Admin Site over short timeframe. I handled all of the UX Design work for this aspect of the project, and collaborated with the Project Manager, Lead Developer, and UI Designer. DSG will create a custom CMS solution plan as a Phase 1 rollout, incorporating UX Design for functionality and a skinned design for the CMS solution as well as sample Landing Page designs to demonstrate output and minimize production timelines and cost. The goal is to get buy in for developing and rolling out the solution in Phase 2. The documentation below serves the purpose of extending what DSG understands about the requirements in order to provide a full specification document at the end of the discovery process with all major and minor details accounted for and understood. This will be a continuous document, which will have updated information, in full, after each of our discovery sessions with Delta. 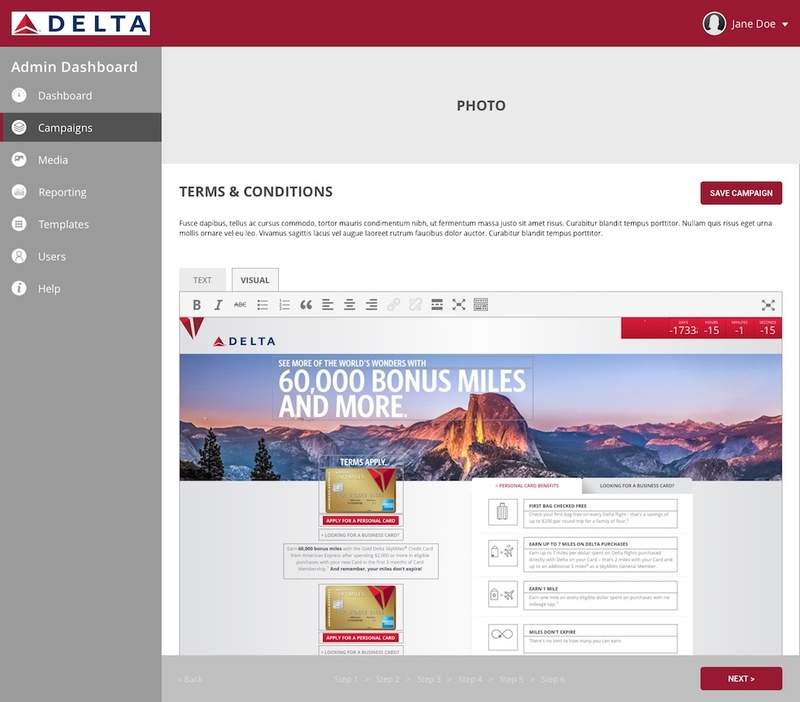 Delta provided a list of Likes, Pain Points and a Wish List for the future of landing pages and managing landing pages and elaborated on the process entailed. Upload and manage: images, HTML/CSS, and Content Layouts. Create custom urls for each site. View analytics and metrics – currently using Adobe Analytics, Delta could use Google Analytics – but no preference for either and looking for recommendations. Reporting – Delta would like more insight into consumer behavior metrics. Clean UX which needs to be easy to understand. These are not tied directly with Amex. Once a user has gone through the process (funnel), they will submit an application on the Amex site. Ideally would like to see up to eight (8) card offers on a single page. Would like the option for variations for layouts of 2, 4, 6 & 8 cards on a page. Requires multiple pages for tracking. Cannot control the success rate of DM at the moment. Need to be ADA compliant. DSG will need to know of any security restrictions – communication with the involved parties would be recommended. If possible could we be granted access to SSO via the IT team involved. Looking for recommendations if anything is easier. Prefill data – Delta will find out the team responsible for DSG to speak to regarding opportunities for integration. New and Existing members may sign up for additional Amex cards. Currently need to go through a third party to pull reports. Delta would like to be able to pull reports at will. Data required in reports: Who clicked offer, total/unique clicks, click through’s to Amex. Is Amex able to provide confirmation if user completed an application. Delta will provide sample reports of what they currently receive from agency. Currently not getting a read on the comparisons of the various offers and reactions to offers. comments. Along with only having access to this area of the Microsite CMS to which Delta will provide access. Delta will provide a brief on the current Amex approval process. 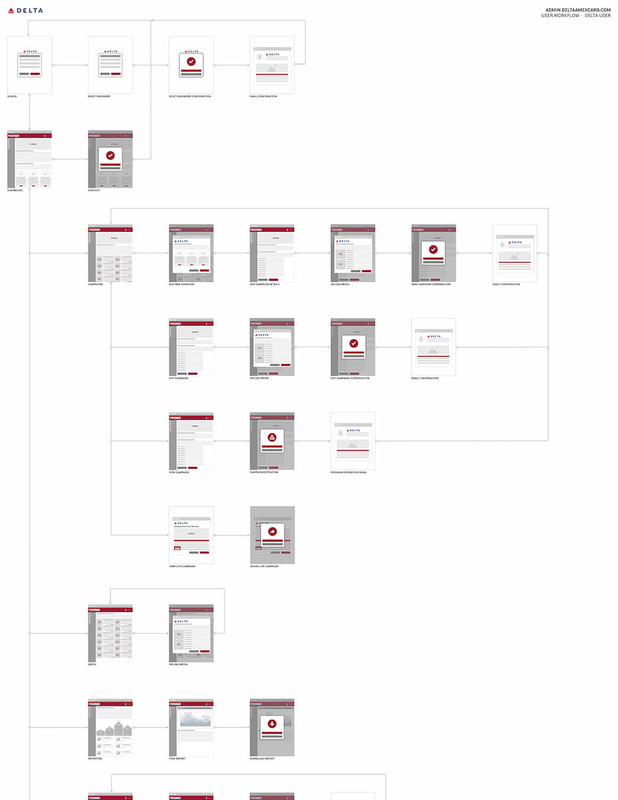 This was a short project in which my role was to quickly build the Competitive Anlaysis, User Workflow diagram, and Wireframes for the Admin Site. Delta signed off on this work and the team is now proceeding to the development phase.